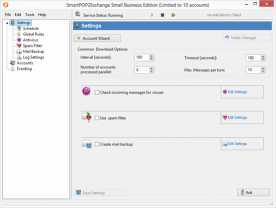 SmartPOP2Exchange helps you to connect your existing POP3 and IMAP accounts to a SMTP or Exchange mail server. 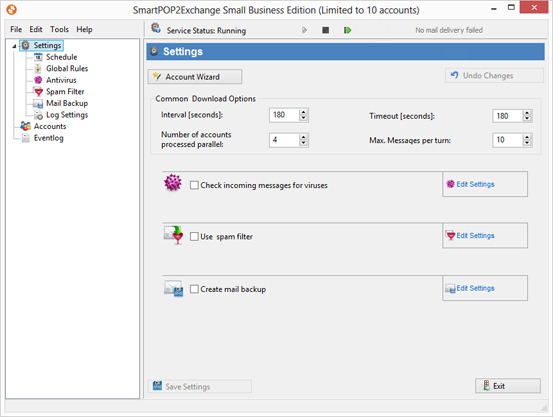 SmartPOP2Exchange works in the background and downloads all messages from various POP3IMAP accounts and forwards them to your SMTPExchange server.  It also supports downloading of RSS Feeds and delivers them as mail messages to specified accounts. An easy to use configuration tool allows you to adjust common settings like download interval timeout etc. and to add delete or configure your SMTPExchange and POP3IMAP accounts. An additional Remote Control Software for SmartPOP2Exchange allows you to do all this from any other PC over network. A configurable spam filter allows you to tag or delete mails which have been identified as spam. The popular SpamAssassin software is used to identify the spam mails. SmartPOP2Exchange also supports a flexible and powerful set of rules which allow you to define additional actions for certain messages. Nearly all installed virus scanners can be used by SmartPOP2Exchange in order to identify mails infected by a virus or trojan. The Enterprise Edition already has the popular virus scanner ClamAV integrated.